Antigua is the larger of two islands that make up the country of Antigua and Barbuda, located east of Puerto Rico in the archipelago known as the Lesser Antilles. A small island, just 171 square miles, Antigua is known for its large number of white sand beaches - 365, one for every day of the year. 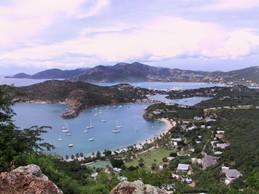 Famous Antigua residents include rocker Eric Clapton, fashion designer Giorgio Armani, and novelist Jamaica Kincaid. Antigua was originally inhabited by the Arawak tribe, as far back as 2400 B.C. The island was "discovered" by Christopher Columbus and the Spanish in 1493 on his second voyage. Early settlements by the Spanish and French were replaced by a permanent British colony in 1667. The English populated the island by importing Irish-Catholic slaves to work on the island's sugar plantations. Remnants of this Irish-Catholic heritage can still be found on the island. The island became an independent state in 1981. Nelson's Dockyard - This historic dockyard, once the haunt of sailors such as Admiral Nelson and Prince William Henry, is situated in one of the world's best protected natural harbors. The grounds include restored colonial forts, residences, and barracks that demonstrate the might of the British navy as it guarded the colony. Today, the harbor also houses a "fleet" of private yachts and popular waterfront restaurants. Shirley Heights - Adjacent to Nelson's Dockyard, the military fortifications at Shirley Heights were once the main lookout point for guards scanning for hostile ships. Barracks, arched walkways, and other structures recreate the post, and visitors will be stunned by the sweeping views of English Harbor. One admission fee includes entry to both Nelson's Dockyard and Shirley Heights. The Museum of Antigua and Barbuda - Established in 1985, this museum tells the story of the island through hundreds of documents and artifacts. The structure also houses an extensive research library. The Beaches - All of the more than 300 beaches on Antigua are public, and most offer a variety of lounge chairs, shade umbrellas, and watersports equipment for rent. Cathedral of St. John the Divine - This Anglican cathedral has been rebuilt and renovated several times, and the baroque structure with 69-foot twin spires dramatically overlooks the city of St. John's. Cricket - As with most former British Commonwealth nations, the game of cricket is hugely popular on the island. In fact, the 2007 Cricket world cup championship matches will be held in Antigua. Antigua is easily accessible by air with non-stop flights from San Juan, New York, Atlanta, Miami, and other US cities. Hundreds of other North America cities are accessible via connecting flights. Accommodations on the island range from deluxe beachfront resorts, such as the Half Moon Bay Club and Jumby Bay, to smaller locally owned establishments. A limited number of condos are also available on the island as are all-inclusive resorts, such as Sandals. A car rental is a necessity when visiting Antigua so that you can visit all of the various beaches and sample the many excellent restaurants that dot the island.